Intro: At the end of the 21th century a war overcame us again. This war does not take place on earth this time, but in the dark space. A small group of last warriors “The Black Eagles” has gathered on board the Black Moon to lead the last fight for us. Because?… the Ghouls are Coming. Review: From the makers of Dreamflight and Invasion VR comes Blackmoon VR. It’s a space shooter, FPS and even a music video all rolled into one. This is a game that refuses to fit into any single genre, but is it any good at any of them? Well, the story goes that you are a warrior called a “Black Eagle” and you live onboard the Starship Black Moon. You will need to use your piloting skills as well as your shooting skills to make you missions a success. Starting off you will be piloting a ship that has laser cannons and even an EMP pulse which is handy in the heat of the battle. Then after you have survived the dog flight you will be landing on a planet, getting out of your ship and shooting some rather nasty robots who seem to pop up from nowhere. Then after all that it’s back into the ship for even more dog fighting action in space! 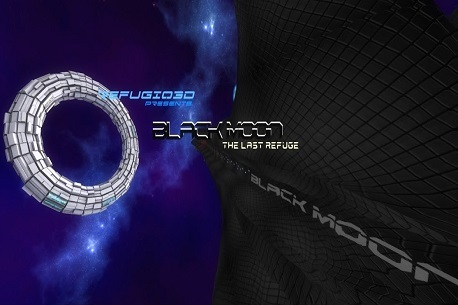 Verdict: Refugio3D have tried to do something new with BlackMoon VR and some parts like the space battles set to cinematic music work really well, but others sections like the FPS not so much. It’s like a poor version of No Man’s Sky only without the depth. The good news is that I do have high hopes that Refugio3D will go on to make this game better and better, so maybe it is worth getting it now, looking at it as an investment for the future. Or even better, keep an eye on it for a future purchase.